With all of the different brands that you can choose from, it can be an overwhelming task to decide which one is the best guitar for your musical needs. Gretsch is a name that has been around a very long time, building up a solid fan base of musicians. 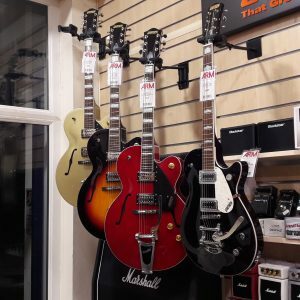 If you are looking to buy Gretsch guitars in Nottingham, be sure to stop by a physical store location to get a feel for this guitar and learn about its sound before you invest the money. This will take a brief look at the history of Gretsch guitars and why these are great choices for you. Gretsch was originally founded in 1883 in New York. Originally, Friedrich Gretsch manufactured tambourines, drums, and banjos. Eventually this company progressed into making very distinctive guitar models, which would end up being the popular choice for classic guitar heroes such as Chuck Berry and Bo Diddley. Some of the popular models that Gretsch is known for include the Duo Jet, Nashville, Country Club, and the White Falcon. At first, this was a more popular choice for musicians in the Rockabilly genre. Then George Harrison chose the Gretsch for his playstyle, helping make this brand even more popular. When it comes to Gretsch guitars, you have the choice between high-quality acoustic guitars or electric guitars. Gretsch guitars have a very distinct sound to them, which makes them fit in a very specific niche. They can be pricey, but if you are an experienced guitarist that is looking for a specific sound, this could be the perfect option for you. These are stylish and high-quality guitars that come in different varieties for better customization. Between different body types and materials, every single guitar from this company is different. There are different collections, each having their own sound and feel as well. You have a lot to consider when it comes to looking for the perfect guitar. Gretsch has a lot to offer those guitarists that have more experience playing. You such a variety of options for a truly customized feel with your guitar, from cheaper options to much pricier ones. Think about your budget and decide how much you are willing to spend for your next guitar. Your options vary greatly depending on your budget, so be sure that you know exactly what you want to spend before you get lost in the aesthetics and features that you can find with the Gretsch guitars. Above all else, be sure to go to a store location and try one out for yourself. This is especially important when it comes to Gretsch guitars because they have such a unique sound to them that you want to make sure that you are choosing something that sounds right for the type of music that you are playing. It is also important to try out a guitar in the store because guitars have a different shape and feel to them depending on the materials used and its design, so you want to choose an option that is comfortable for you. Not looking for Gretsch Guitars? We also have other Guitar Brands.